Rebekah Dopp is Principal, News & Local Media – Global Partnerships at Google. 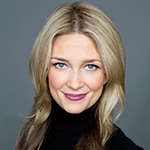 She joined the company in September 2016 as Head of Local TV Partnerships for YouTube TV and was the sole architect of the local broadcast engagement strategy for YouTube TV as part of the launch team. Under her leadership, 99%+ of the 800+ local broadcast stations executed deals to be distributed on YouTube TV. Prior to joining Google, Dopp was Senior Vice President, Advanced Digital Services for CBS. She served as department expert	in digital technology and lead technologist during complex negotiations. Her team managed the execution of digital distribution initiatives across the CBS portfolio and led the deal execution and operations of digital products (including Video on Demand and CBS All Access). She was instrumental in the nationwide deployment of CBS All Access, which achieved a penetration of over 95% of TV households in less than a year. CBS All Access was the first-ever (and currently only) direct-to-consumer streaming service widely adopted by local broadcasters. Prior to CBS, Dopp was Vice President, Global Technology Business Management, for Home Box Office, Inc.(HBO). She led the teams responsible for cross-group coordination, program management, technology partner relationships and overall communications for Digital Products (including HBO GO). In addition, Dopp negotiated technology agreements, managed strategic vendor relationships and managed HBO’s technology P&L. Dopp joined HBO in 2001 and held several leadership positions in Affiliate Relations, responsible for partner management and domestic network distribution. She moved to the technology group in 2007 as Vice President, Business Initiatives and Strategy, where she was tapped to create and lead a business department embedded in the technology organization dedicated to bringing new digital products to fruition.In that role, she managed strategic partner alliances and negotiated contracts with domestic and international technology partners and affiliates, executing deals in support of DRM, stream management and optimization for HBO GO, as well as closed captioning, transcoding and encryption services for linear and non-linear distribution. She was also the sponsor for her department’s role in product launches and enhancements including the launch and implementation of HBO GO and the expansion of HBO on Demand to ten times the then-current library. She is passionate about her work in the non-profit sector. She currently serves on the board of trustees for The New York Foundling, and she served as chairman of the board for the Child Abuse Prevention Program (CAPP) and on the board of directors for Bottomless Closet. She has participated in ringing the opening bell at the New York Stock Exchange and the opening bell at Nasdaq - both in honor of her non-profit work for children. Dopp holds a Bachelor’s degree with a Finance concentration from The College of William & Mary and completed the CTAM U. executive management program at the Harvard Business School. She is a fellow of the Betsy Magness Leadership Institute and a recipient of the 2014 Bravo! Outstanding Achievements Award from the Chesterfield Public Education Foundation. Dopp lives with her husband Jeff Samuel, their young children, and their hound dog, Arley.